I'm running out of superlatives. Or perhaps, more precisely, I am running out of synonyms for words like amazed, stunned, astonished or shocked. Please go here and look at this series of 8 photos. See what I mean? Exploring this city is like going to Paris - you start to bore yourself with superlatives - like crying wolf, they start to lose their impact when used so often. Of course, I could just let the photos speak for themselves. After all, this is supposed to be a photoblog which is typically driven by the images, with minimal or nonexistent text. But this website has metamorphised over time and the writing has become as important as the photos. I believe most regular visitors here enjoy reading, much as I enjoy learning and writing. So now there is an expectation. The New York Yacht Club clubhouse is located at 37 W. 44th Street. 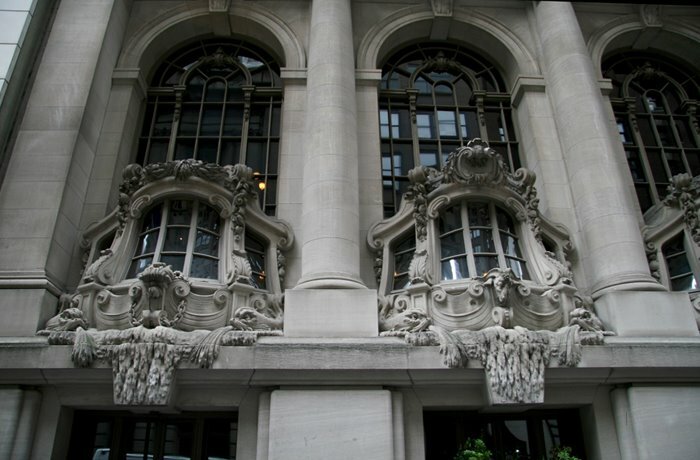 It was designed by Warren and Wetmore, the firm also responsible for the exterior of Grand Central Station. Founded in 1844, the club had several modest headquarters for its first half century. But the activity of yachting became so luxurious that by the 1890's -- with giant steam yachts of 200 feet or more -- a new clubhouse seemed in order. A competition attracted entries ranging from the boring -- R.H. Robertson's plain design could have been a small-town businessman's lunch club -- to the opulent -- Howard, Cauldwell & Morgan's giant, modern French design with three windows shaped like the prows of oared galleys. The winning design was the first major work of the new partnership of Whitney Warren and Charles Wetmore. They produced a rich, five-story limestone front with three windows patterned after the sterns of early Dutch ships and a large terrace at the fourth floor topped by flagstaffs and a giant wooden pergola and trellis. It is the model room, though, that will astound the uninitiated visitor. Behind the facade's three great windows, the model room stretches back almost 100 feet under a giant floral stained glass ceiling. Ringed by a balcony with a galleon railing, the room contains hundreds of full- and half-hull ship models, including one of every defender of the America's Cup. Note: Membership to the New York Yacht Club is by invitation only. To tour the building, you must be accompanied by a member. Related Postings: Transportation, Grand Central, Passing Time, The Oyster Bar, Just Passing Through.